With the pressures of land intensification, water demand and population growth, the design and implementation of more integrated approaches to environmental management to tackle these issues seems to be on everyone’s minds. Integrated Catchment Management (ICM) has been advocated for land and water management since the 1960s. The Parliamentary Commissioner for the Environment’s report Growing for Good was a renewed call for ICM approaches for sustainable land and water management. But learning how to do ICM effectively is still a challenge. Catchment Connections has been reactivated to share learning about ICM. The newsletter is primarily a forum for sharing research experience from the FRST-funded ICM research programme. The programme is led by Landcare Research in partnership with Cawthron Institute and Tasman District Council, in collaboration with other researchers. We would also love to include your contributions to enable wider sharing of the ICM experience among practitioners – whether from regional and district councils, NZ Landcare Trust, iwi groups, sector groups, catchment and community groups, or the wider research community. Fundamental to ICM is integration, and a theme of ICM is working across organisations, across the landscape, across disciplines and with resource users. 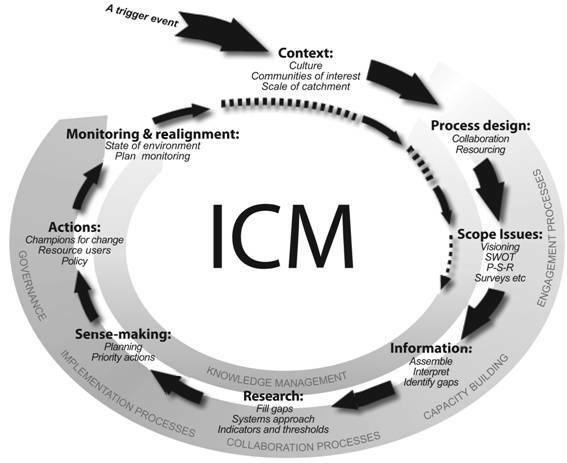 In this edition we present our take on ICM as a process for engagement, learning and action. With examples from the Motueka catchment where the ICM research programme is based, we describe the process of identifying ICM issues and introduce a context for stakeholder engagement generally and with iwi specifically. Some useful tools for ICM are described, ranging from the Influence Matrix methodology to the WATYIELD water balance model. Finally we acknowledge the impact that catchments can have offshore in describing the concept of a river plume ecosystem. Integrated Catchment Management is a process that recognises the catchment as the appropriate organising unit for understanding and managing ecosystem processes in a context that includes social, economic and political considerations, and guides communities towards an agreed vision of sustainable land and water resource management for their catchment. ICM is also a research approach. Its objective is both to analyse and synthesise to provide the knowledge needed to integrate human and environmental systems. It aims to improve understanding of catchment processes from the ridgetops to the sea, to provide tools for sustainable management, and to help people plan for more sustainable futures. As a policy approach, ICM is a way to promote sustainable management of the natural and physical environment under the Resource Management Act 1991, and thereby contribute to the social, economic, environmental, and cultural well-being of communities promoted under the Local Government Act 2002. As a human process, it encourages communities, government, businesses, sector groups, stakeholders and individuals to work collaboratively toward sustainability, with people seen as integral parts of natural ecosystems. While this process might suggest a major role for biophysical science such as hydrology, modern catchment management is less of a technological fix involving top-down management and engineering solutions than 50 years ago. Catchment managers still need knowledge about biophysical processes such as water yields, sediment loads and aquatic ecology; but they also need to understand community values and aspirations for their place in the catchment, and engage stakeholders in resource management. These bring in social, cultural and economic (including political) dimensions to management. So we see modern ICM as having two pillars: biophysical knowledge and social process. Increasingly this combined approach will be needed when working in an integrated way at any scale, not just catchment scale. The Motueka catchment is home to a national ICM research programme. ICM research was initiated here following a Top-of-the-South sector workshop, which saw land-use impacts on fresh and marine waters as a priority issue. An important reason for choosing the Motueka River catchment for research was the strong links between the land, river and coastal environments. The Motueka catchment was chosen not only for its diversity of climate, geology, soils, land and water uses, but for its range of environmental issues. Water allocation is a significant issue among water users, especially forestry and horticulture – particularly the availability and allocation of surface and groundwater in this seasonally-dry catchment. The impacts of water use and land management practices – especially sediment movement – on the Motueka River and its tributaries, which are a nationally and internationally recognised trout fishery. The consequences of the combined impacts of land and river management on coastal aquaculture and fishing industries, which are of national economic importance. Cumulative effects of development by an increasing and more diverse population, including increasing tourism and Māori cultural and business opportunities. A fifth research component is integrative tools and methods across the water, land, coastal and human themes. These themes inform the policy needs of the Tasman District Council through its Tasman Resource Management Plan and its Long Term Council Community Plan processes. From the council’s perspective, some current priorities are the setting of water allocation limits, a monitoring strategy for the state of the environment, policy development for river management including gravel extraction and floodplain management, management of diffuse discharges, and coastal space allocation for aquaculture development. Integrated catchment management covers a wide variety of scientific and resource management disciplines and a diverse range of stakeholders/end-users. Successful ICM needs leadership to encourage conversations among all the players about the resource management issues across the catchment. Discussion among different resource users often doesn’t take place until controversy hits, usually leading to an adversarial situation with the parties on opposite sides of a court room. Encouraging conversations among diverse groups is not easy, but our research approach based on collaborative learning theory and methods provides a basis for such discussion to occur. In the ICM-Motueka programme we have placed an emphasis on trying many different ways to support stakeholder engagement and engender a shared understanding of the Motueka catchment. These approaches have ranged from learning groups that have come together around both science and management issues to collaborative initiatives that have used art and photography as a conversation centrepiece. In this inaugural newsletter we will provide an introduction to the format of our annual general meetings, and in other issues we will cover other stakeholder engagement processes. From this perspective our annual 3-day AGMs can be seen to have contributed in many ways to the successful adoption and implementation of the ICM approach. The AGMs have been an excellent way to review research progress, build social capital among the team and with stakeholders, and to interact with the catchment communities. Depending on the theme, each AGM requires contributions from ICM researchers and subcontractors, our resource management partner Tasman District Council, and stakeholders such as forestry, farming and marine farm reps, DOC, Fish & Game, and iwi – groups which in the past may have struggled to reach consensus. Participation has resulted in stakeholders observing the research process from the inside, rather than the outside, and being willing to contribute to identification of issues and to the direction of the programme in finding solutions. The AGMs are also an opportunity for stakeholders to hear from each other about their concerns and issues. 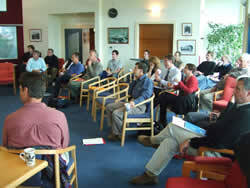 A 2004 workshop with TDC mapped ICM research into their Resource Management Plan framework. The river gravel/channel dynamics workshop in 2006 provided an opportunity for researchers and a range of stakeholders to discuss an issue that has been highly controversial in the Tasman District for decades. This discussion helped defuse tensions about gravel extraction between extractors and council by providing an objective review of gravel fluxes and the limitations of river cross-section surveys. Feedback from the workshop indicated that a common level of understanding had been reached and priorities for further work were identified. Similarly, the land–marine day on a boat in Tasman Bay (2006) gave all involved an appreciation of the scale of the river outwelling plume and the difficulties associated with managing resources in the coastal zone. How can we account for all the trade-offs that happen when we manage resources at catchment scale? In this article we describe a participatory method called the Influence Matrix, which can be used to identify and prioritise factors affecting catchment futures. Over a series of six participatory workshops with the ICM Community Reference Group (ICM-CRG), an ICM research team developed and trialled an Influence Matrix method. The aim of this collaborative exercise was to actively involve scientists and community members in thinking about the future of the Motueka catchment based on collective goals, envisioning, sharing understanding, and model building. The model building provides a structure and process to aid the dialogue process. It helps to organise and evaluate ideas and information generated by the group, using elementary mathematics. 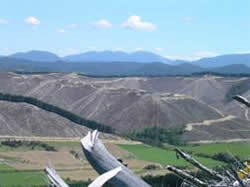 The residents of the Motueka catchment want to manage their catchment so as to ensure they continue to enjoy … a safe place to play and live, its pristine character and beauty, its identity, economic and ecological balance, its economic viability for business development, its exceptional climate, biological, community and landscape diversity & coastal integrity. Results and their application for strategic policy development were reported back to the group and to the Tasman District Council, who had one staff member participating in the ICM-CRG. The significance of this work is the trialling of an integrative Triple-Bottom-Line modelling approach using a participatory process with a group of non-technical catchment residents and scientists. The process and its results raised awareness of the value of such tools for informing Long Term Council Community Plans, and residents’ own perspectives. It is also a good example of collaboration among different disciplines within the ICM research team: an ecological economist, hydrologist, and social scientists. This work is informing current development of a Motueka Catchment futures model, part of the IDEAS modelling framework. Cole A, Allen W, Kilvington M, Fenemor A, Bowden, W 2006 Understanding Whole-of-System Sustainability in the Motueka Catchment: Participatory Modelling with an Influence Matrix Landcare Research Report LC0506/087. Cole A, Allen W, Kilvington M, Fenemor A.2004. Challenges for Sustainable Development in the Motueka Catchment. 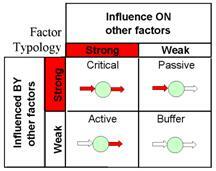 Participatory Modelling with an Influence Matrix. . Conference poster. Incorporating tangata whenua perspectives, values and knowledge requires the right process and effective dialogue to be established early on in ICM. The development of iwi-led and iwi-issue-driven collaborative projects has been instrumental in building strong iwi–science partnerships and increasing iwi engagement and interaction in ICM science objectives and multi-disciplinary research. Engagement has been at many levels, including iwi participation at organised meetings and workshops, field-days, project planning, community reference groups, joint papers, sharing expertise and knowledge, and learning together. Iwi representatives have also attended and spoken at several ICM AGMs and science meetings, and accompanied scientists in the field. This spirit of cooperation and collaboration creates an environment in which we respect each other, learn, understand, and share different perspectives, It also improves access and uptake of science and technical information. Establishing the right environment is therefore an integral part of ICM for increasing multi-stakeholder engagement, particularly iwi involvement. An integrated and inclusive understanding of stakeholder knowledge and values ultimately informs, guides, and improves decision-making to achieve the sustainable management natural and cultural resources and strategies for achieving stakeholder aspirations. Improving capabilities for decision making. 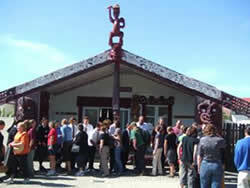 Te Uri o Hau is a hapu of Ngati Whatua whose rohe covers the northern part of the Kaipara Harbour. They reached a deed of settlement with the Crown in September 2000. The Kaipara is one of those sacred taonga and Te Uri o Hau is responsible for protecting it for the benefit of all people. Following a successful seeding grant application to FRST/Health Research Council, Te Uri o Hau, through their resource management arm Environs Holdings, provided the ‘glue’ or coordination role to initiate a process that began with hui in 2005 facilitated by Glen Lauder (Common Ground), Shaun Awatere and Chris Phillips (Landcare Research). The hui used lessons learnt from our Motueka experience to explore an ICM approach for developing and implementing a plan of action for a multi-stakeholder participatory process focused on improving the management of land, freshwater, and near-coastal environments with multiple, interacting and potentially conflicting land and harbour uses. The importance of leadership, governance and commitment to ensure the project moves forward. A management group (Integrated Kaipara Management Group – IKMG) was later formed with representatives from regional and district councils and other government agencies and community groups. 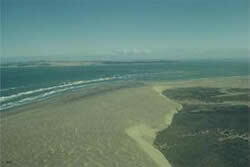 The group’s vision is 'A healthy and productive Kaipara Harbour'. The establishment of IKMG is assisting Te Uri o Hau in meeting their responsibilities under the Te Uri o Hau Settlement Act and is consistent with a number of memoranda of understanding and protocols established between Te Uri o Hau Settlement Trust and key stakeholders. In June 2007 an environmental coordinator, Leane Makey, was appointed to assist the activities of IKMG and has begun assembling a database of information about the Kaipara Harbour and its contributing environments. A new website for this project is expected to go live in early 2008. This website is helping create a focus point for those with an interest in the management of the Kaipara Harbour, will become a repository for information about the Kaipara, and is assisting in coordinating the group's activities and affairs. How much will stream flows increase when a pine forest is cleared? Will irrigators downstream be affected by steeper farmland reverting to scrub? If I establish a forest, will it reduce the low and flood flows downstream? These types of questions can be addressed using a land-use change toolkit completed by staff at Landcare Research with Ministry for the Environment and regional council support. This toolkit comprises a summary of knowledge on water use by different vegetation covers in New Zealand and a spreadsheet-based hydrological model: WATYIELD. WATYIELD is a water balance model working on a daily time step and is particularly suited for catchments up to 50 square kilometres. The model takes daily rainfall data and calculates daily catchment water yields where there is a limited amount of data on the climate, soils, and vegetation of the catchment. It runs in a Windows environment and uses an EXCEL spreadsheet for input and output of data. All of these reports and the WATYIELD model are available for free download or hard copies can be supplied for a small charge. Since initial development WATYIELD has received some further refinements and improvements that are not included in the downloadable version. Based on our observations of the influence of the Motueka River discharge on coastal waters and seabed habitats, we propose the development and implementation of a river plume ecosystem concept for management of New Zealand’s coastal environment. Management of coastal regions around New Zealand is often conducted without evaluating and considering the extent and degree of influence of river outflows. Coastal aquaculture development, in particular, is taking place in many regions throughout the country at locations potentially influenced by river outflows with largely unknown consequences. The Motueka ‘catchment’ effectively extends offshore for many kilometres into the marine environment of Tasman Bay. Considering this, we can redraw catchment boundaries to encompass a mobile and variable-sized freshwater plume of >400 km2 that is frequently achieved during rainfall events. The main freshwater influences on the coastal environment include salinity, temperature (and related density stratification), nutrients, phytoplankton biomass, suspended sediments (and related water clarity), and a variety of potential contaminants. ICM research shows that approximately 50 km2 of seabed off the Motueka River Mouth in Tasman Bay has a terrestrial signature arising from the river's outwelling plume. Organic C/N ratios, stable C & N isotope ratios, certain lipid biomarkers and trace metal concentrations provided useful indicators of terrestrial and riverine influence on subtidal sediments extending at least 6 km offshore from the river mouth. These sediment influences also appear to dictate patterns in the abundance and diversity of seabed animal communities. The results were consistent with simulated sedimentation patterns from Cawthron’s Nelson Bays hydro-dynamic model. Catchment effects were shown to be particularly relevant to the management of three aquaculture management areas (AMAs) covering a total of >40 km2 in western Tasman Bay. Our results suggest that the deposition of river-borne sediments discharged into the bay during major rainfall events could mask (or mitigate) benthic impacts caused by aquaculture activities. Natural sedimentation events were shown to significantly reduce the survival of juvenile shellfish that drop to the seabed beneath commercial spat collection facilities. Because of this work, the Ministry of Fisheries has been able to relax its requirements for exhaustive dredging to avoid overpopulation of shellfish. In situ experiments suggest that the deposition and chronic resuspension of catchment-borne suspended sediments can reduce feeding and survival of scallops. Thus land catchment activities can contribute to the extreme harvest variability within the Nelson Bays' scallop enhancement programme. In conjunction with a series of related outputs showing the more spatially extensive water-column effects, this information demonstrates that coastal ecosystem management cannot be effectively conducted without considering the activities on the entire land–sea continuum comprising our redefined 'catchment'.